The iPad is one of the best selling devices available in today’s market. Developed by Apple Inc., the gadget is known for its sleek design, advanced features, high quality display and light weight. Everyone of us wants to own this handy piece of hardware, it is the student and business class that have contributed a lot in its increased sales chart. Nowadays, it is very common to find students or employees doing their work on iPads sitting at wifi hotspots like coffee shops, hotels and airports. Even though the iPad is known for its in-built security system, it is still vulnerable to numerous online threats at public WiFi hotspots. Therefore, it is always recommended to use online security tools like a Virtual Private Network or VPN while using public wifi hubs in order to ensure maximum security. The iPad comes with numerous security features that make it an ideal device for corporate as well as personal use. Like the iPhone, the iPad also supports VPN which is basically a feature to provide advanced security against different online threats. When we use an iPad VPN, a virtual tunnel is created around our network offering high security to send and received data. It is a similar process to how different websites use SSL technology to safeguard the user from other users’ eyes. Various ways and configuration settings are available for iPads, they vary from VPN provider to provider and from protocol to protocol. Although there is not much difference in each setting, a proper setting is advisable to get the most out of the VPN. First of all, download a reliable and trusted VPN such as Hotspot Shield on your iPad. Go to setting options, tap on General, click VPN and then click Add VPN Configuration. After that choose your protocol which is provided by your VPN client. Add access point IP address or server IP address based on business or home intranet use. Enter the credentials such as ID and Password of your VPN in the corresponding field. If you are using a Private Office Based VPN, you have to assign the group name. It is recommended to take professional assistance from your IT department if you are using Office Based VPN. If a certificate is offered by your provider, you need to install it properly before starting the setting-up process. After accomplishing all the above mentioned steps, connect VPN and your iPad will automatically access the point without further requirements. Once configured, you just need to turn your VPN on and off to avail the services. Now, whenever you connect to the internet, always make sure that the VPN is turned on. 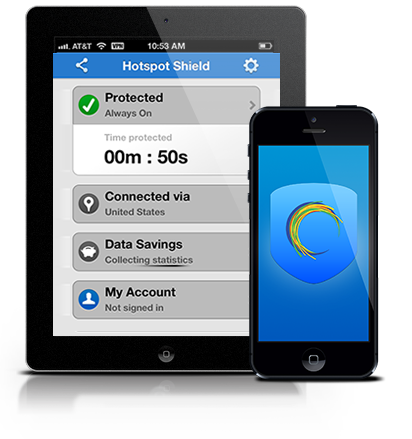 Always use a reliable VPN like Hotspot Shield in order to ensure complete protection. This VPN is not only known for its military grade security and privacy but also for its user friendly features. A green icon of Hotspot Shield on iPad screen shows that your VPN is on and you are completely safe to perform your business or personal tasks with peace of mind. Satinder Singh is an Inbound Marketing Analyst at Click Labs, writing for Hotspot Shield, the leading Free VPN service provider. He has shared over 50+ articles pertaining to internet security, online privacy and internet freedom on different technology blogs. Satinder Singh is an Inbound Internet Marketing Analyst at Click Labs, writing for Hotspot Shield, the leading Free VPN service provider. He has shared over 50+ articles pertaining to internet security, online privacy and internet freedom on different technology blogs. I read you blog its very good.. However I would like to share my experience when i was using Hotspot on my iPad.. It kept on disconnecting. Since then I have moved on to other VPN services such as purevpn, TunnelBear and Hidemyass. I totally agree with the idea of using a vpn on your iPAd for maximum security and i must say you have done a very good job explaining the facts. I’ve been using StrongVPN in China for nearly 3 years and I’ve always been satisfied with it. StrongVPN is reliable, easy to set up and have a great live help service. I have already recommended it to many friends which are also satisfied with this VPN. suppose you were to write a awesome title? I mean, I don’t want to tell you how to run your blog, but suppose you added something that grabbed folk’s attention? I mean Protect your iPad with a VPN | Kabir News is a little plain.